Mudu, a historic cultural town, is located at the foot between Linyan mountain and Tien-Ping Mountain in the west of Suzhou. Its waterways are connected to the Taihu Lake. According to the tour guide, many gardens have been renovated and open to the public. Among them, Yan Family's residence, which used to be the residence of the former Taiwan's politician YanJiagan (嚴家淦), is the most famous garden in Mu-Du. China's Emperor Qianlong (乾隆) in Qing Dynasty liked to stop by the gardens here whenever he visited Su-Zhou. 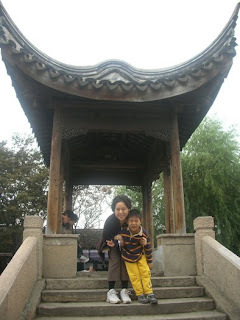 Our plan for the day was to climb Tien-Ping Mountain first and visit Mu-Du town on the way back. But when we stopped at Mu-Du, we saw the mountain leaves did not change to orange and brown color yet, so we decided to visit Mu-Du and go home rest. Since Winston coughed a lot the night before, we all did not get enough sleep, and the weather seemed cloudy, so our visit to this old town was short and brief. According to the visitor center's instructions, there were only 3 gardens open to the public and the ticket was $60 RMB each, a bit expensive (Ton-Li, $80 for eight Gardens) . Based on our experiences, some free entry gardens were good and some paid gardens might not be as good, but most of the gardens were generally great. It was free to enter the old town but if we wanted to visit a specific garden we had to pay. The entrance of the town was pleasant and clean, and was a bit mixed with modern architectures. 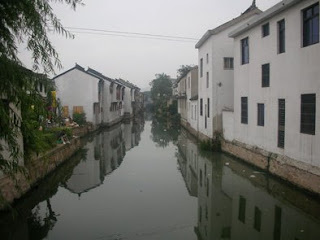 But after we enter the small town, the streets and waterways were dirty. Some motorcycles were running on the narrow walkways. The wind brought some bad smell from the filthy waterway once in a while. The buildings on the streets still kept their ancient faces but some looked abandoned and damaged. It was sad that the government did not put enough efforts to restore the old picture and hire some workers to clean and maintain this area. We walked over the small town and the weather was a bit cloudy and raining, So we decided to go home. We plan to see the autumn leaves of the mountain 2 weeks later and will visit Yan's Garden here on the way back. The special part of Mu-Du was its natural landscape of mountains. Water and Mountains were the two musts in ancient Chinese Gardens. The hills in other gardens we visited before were tiny and artificial. 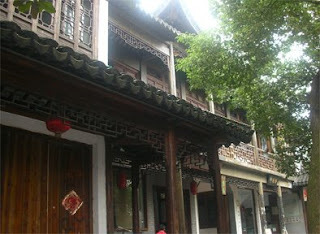 Nevertheless, Mu-Du did not feel as good because its lack of proper maintaining. 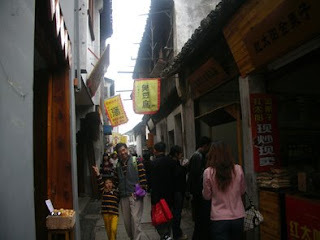 We did not see any foreigners visiting Mu-Du. Maybe it was the signal of "not as good". I hope the travel bureau will soon restore this area and keep the environment in good condition while it is still recoverable. It is too much of a treasure to be missed.